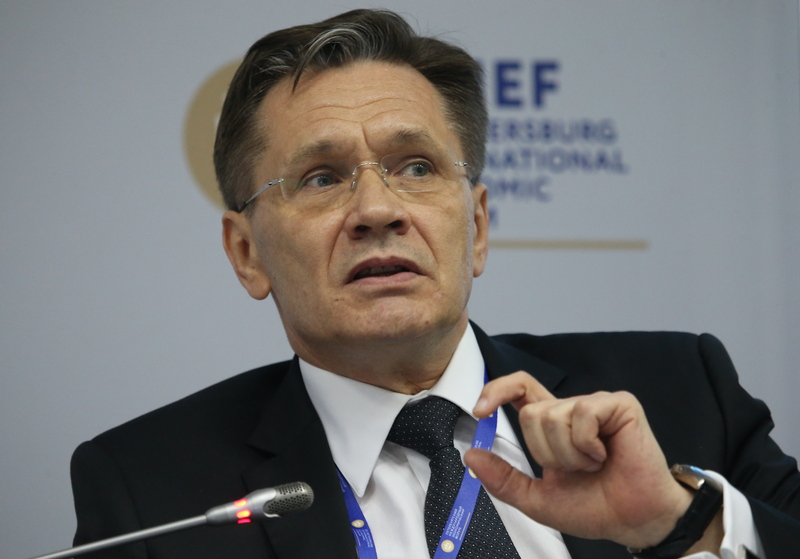 Alexei Likhachev, First Deputy Minister of Economic Development at SPIEF-2016. Addressing a business conference round table "Russia - India: new stage of economic partnership" at the SPIEF on June 16, Alexei Likhachev, First Deputy Minister of Economic Development, outlined the projected thrust areas to boost bilateral economic cooperation. Alexei Likhachev, First Deputy Minister of Economic Development, outlined the key directions of developing bilateral economic relations with India, while speaking on Friday at a business round table "Russia - India: a new stage of economic partnership" at the St. Petersburg International Economic Forum 2016. "Of course, the rates and volumes, to which the country's leadership orients us, and those required by business are completely different," said Likhachev. It is therefore very important to work on a study group on the future of the preferential trade agreement between the Eurasian Union and India. "We are ready to move in this direction as soon as the Indian side is ready. This is important not only in terms of removing specific barriers to trade, but it will also be a powerful positive signal for business, which will see the two countries wanting to promote an increase in turnover, " said Likhachev. Achieving investment levels up to $ 15 billion over the next decade is the second task that requires intergovernmental cooperation. “In Russia, we have developed a number of mechanisms: a special investment contract, special economic zones. In each region there are preferential conditions for investors. This joint work with the Indian side in the group on investment projects is the most important one”, Likhachev said. "Support is not only verbal, but also by approving specific mechanisms, "road maps". Investment and trade exchange will follow", Likhachev said. "We hope that we can return to completely different figures, a different approach in the development of trade and economic relations between Russia and India," said Likhachev. A business conference round table "Russia - India: new stage of economic partnership" is being held at the SPIEF on June 16. India is being represented by Ramesh Abhishek, Deputy Minister of Trade and Industry, Darius Naushad Forbes, president of the Confederation of Indian Industry and Pankaj Saran, Indian Ambassador to Russia, among others. Friday’s meeting discussed the main features and trends of developing and strengthening trade and economic relations between the two countries, the priority areas of cooperation and measures for the development of Russian-Indian economic cooperation.